Message outline sticker "Merry Christmas"
To make this card I used silver and gold coloured card papers. However, the design would also look great using mirror silver and mirror gold card paper. Click on the picture bellow to see more detail. 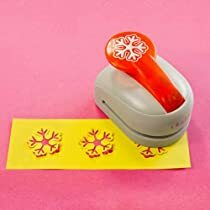 Xmas craft paper punches. Click on pictures to see more detail. Craft edger scissors. Click on pictures to see more detail. Take white card 25 x 18 cm and fold it in half so that you end up with card size 12.5 x 18 cm. Take a silver card paper (size 12.5 cm x 18cm) and using double sided tape attach it to the white card. Take a white card (8 x 8 cm) and using edger scissors cut alongside the edges of the white card. Take a gold coloured card paper and using a snowflake paper punch cut out snowflakes shapes into the card. Attach the gold coloured card to the white card using double sided tape. Cut out a big snowflake shape from a silver coloured card paper and attach the silver snowflake to the gold card paper using a foam pad. Attach a silver adhesive gem to the big snowflake. Attach gold - white card with the silver snowflake to the silver coloured card. Attach Merry Christmas outline sticker to the card.